Sushil Finance Franchise commenced offering of a business association opportunity since Jan 2009. Further, Sushil Finance Franchise has identified that every business associate has a different skill set, different expectations, different goals and hence it realised the importance of having multiple business association models such that each individual can choose the model as per his/her own preferences. Introducing partner – Under this method, one only acts as a referring partner. The other activities like advising, guiding and undertaking the trading is taken care of by Sushil Finance. At Sushil Finance, a business partner can expect all the support that any other brokerage firm would provide. It supports a person in the niche stage of their business by helping them in developing a client base. It also provides a dedicated relationship manager, who is entirely involved in helping the business associate in setting up business, building client base, attracting new clients, maintaining relations with existing clients etc. Further, it also offers research related training and reading material to the business partner who may in turn share the knowledge with its customers. Sushil Finance also offers wealth management services and hence a business partner has a multiple revenue generating source by cross selling the products. Apart from the above, it offers a competitive brokerage revenue model which is the key factor for any business partner. Lastly, a business partner gets to choose the business model and the arrangement from the above 4 options – this offering can definitely be said to be one of the key advantages of Sushil Finance. A center partner acts a like a typical Sushil finance sub broker i.e. it is responsible for identifying potential customers, initiating discussions with them and then serving them. Under this model, the partner itself undertakes the trading activity on behalf of its customers. As a Center Partner of Sushil Finance, one gets to offer all the capital market products to its clientele like equity, derivative, currency, commodity, mutual funds, IPO, bonds, portfolio management services etc. How to become Sushil Finance Sub Broker/Franchise/Center Partner? To be registered as a Suchil Finance Sub Broker, one can visit their website and share basic details, post which the representatives of Sushil Finance will connect with the candidate or the candidate can connect with them via email address/contact number provided at their website. As eligibility criteria, Sushil Finance prescribes only the age and academic qualification parameters. Needless to mention, one needs to have all the requisite certifications from the relevant institutions/regulatory bodies. Upon finalization of the arrangement, an agreement is executed which covers the relevant terms and conditions of this business like the tenure of this agreement, whether it is renewable, the role and responsibilities of all the parties etc. The revenue sharing ratio for this arrangement varies from 50% to 70%, depending upon the relevant factors like initial investment amount, category of sub broker & client disposition etc. The business associate is expected to pay a corpus fund of INR 2 lacs which is refundable to the sub broker. It also prescribes a minimal infrastructure set up such that it represents a decent front office space along with a workstation with good broadband connectivity. It also prescribes certain one-time registration fee for registering with various regulatory institutions – this will depend upon the products that sub-broker wants to deal in, for instance, if the sub broker wishes to deal only in commodities, then it needs to pay registration fee for MCX & NCDEX i.e. INR 2,246. It has also prescribed certain monthly charges towards ODIN and license charges per segment etc. – this is as nominal as INR 500 per month. Sushil Finance Sub broker initiative, assures its business partners of marketing support by supplying advertising material. It also offers a dedicated relationship manager for the business associates to learn client interaction skills. It provides the associates with sufficient research and technology support as well. As the name suggests, this model carries an element of residency i.e. physical presence of a business associate in the Sushil Finance’s premises. The model is similar to that of Center Partner expect that it requires the business partner to be working from Sushil Finance franchise office and operate on its trading terminal. Under this arrangement, the role of building client base, developing and maintaining relations, educating them, advising and guiding them, would entirely be taken care of the business associate. How to become Sushil Finance Resident Partner? For registering as a Sushil Finance Resident Partner, one can connect with them contact coordinates provided by them at their website. Upon touching base with their representatives and getting a walk through the entire model and the terms and conditions, one can freeze the arrangement. Thereafter, an agreement needs to be executed which will document all the relevant terms and conditions. There are no additional eligibility criteria prescribed for this model and hence the eligibility parameters discussed under Center Partner would equally apply herein. Under this model, the ratio of revenue is comparatively lower vis-à-vis the model discussed above. Herein the ratio varies from 20% to 35%, depending upon the relevant factors like the quantum of trade, the strength of client base, the products offered, the credit period turnover etc. Generally, a Resident Partner is required to pay a one-time refundable fee of INR 50,000. Apart from this, there is no infrastructure requirement as one needs to operate from Sushil Finance’s office premises. It offers a great deal of support on technology front, research front and marketing front. This is a further modified version of the Resident partner. As Sushil Finance Managing Partner, one need not be present at the Sushil Finance’s premises. Rather, the Managing Partner, needs to coordinate with a registered dealer of Sushil Finance for undertaking the trading activities. It is pertinent to note that the role which has been passed on to a registered dealer is only undertaking the trading activity and hence the other components of brokership still lie with the business partner. Thus, a Managing Partner is expected to build and develop a client base, advise and guide them and take their orders. These orders would then be passed on to the registered dealer who will do the trading in terminal for the managing partner. Under this model also, the entire product range is available and hence the managing partner has many revenue streams. How to become Sushil Finance Managing Partner? For registering as a Managing Partner, one can visit their website and provide contact details and the concerned team connects with the interested candidate. Also, one can directly get in touch with this team through the contact coordinates available on their website. During the preliminary discussions, the team at Sushil Finance franchise briefs the interested candidate of the role expected from them, the investment, the registration fee and the revenue sharing model. It also discusses in detail the support that one can expect from Sushil Finance Managing partner team. This conversation also helps one understand if the interested candidate fulfils the basic eligibility criteria. The eligibility parameters described under earlier models equally apply herein. Thereafter, an agreement is executed between the candidate and Sushil Finance is executed to document the terms and conditions of this arrangement. This contract typically documents the tenure of the contract, the renewability, the roles of each parties, the compensation plan etc. The revenue sharing model herein is same as discussed under Resident partner and the ratio also varies more or less in the same range i.e. 20% to 35%. Typically, the ratio to be retain under this model would be lesser as compared to the Resident Partner model (considering that all other factors are constant) – this would be on account of reduced functional responsibility thereby leading to lesser returns. The corpus fund and the registration charges as discussed in earlier models equally apply herein and hence the offers would also be the same. The team at Sushil Finance franchise supports a Managing Partner in technology field, research field, marketing field and business execution field. As mentioned under the introduction para, Sushil Finance Introducing partner model is more or less similar to referral programme. Under this arrangement, the business partner’s role is only limited to sourcing of clients for the brokerage firm. Thus, one needs to identify the potential lead/potential investor, take him through the product and service offerings of Sushil Finance franchise, provide details on the support services like research support, access to trading platform/software etc. and thus convert and materialize the potential customer. Thereafter, Sushil Finance franchise would take the matter ahead by registering the client with themselves, opening its account and undertaking trading activities for it. An Introducing partner has the entire product/service spectrum open for offering. No specific eligibility criteria are prescribed, hence the eligibility criteria discussed in above model equally apply herein. Considering the fact that under this model, the role of business associate is limited to referring customers, it is obvious that this model carries a lesser return vis-à-vis other models. But, what needs to be noticed is that the efforts involved are also very limited under this model and considering the efforts involved and the returns offered, this model appears to be very attractive. For an individual with a strong network and good interaction skill, this model can act as an extra source of revenue. This does not need to be a full time thing for any individual and hence any earnings would be an extra source. Under this model, one gets 1/10th share of the revenue offered by client to the brokerage firm, i.e. for every earning made by Sushil Finance from the referred customer, the Introducing Partner gets 10% of such earning. It does not entail introduction of any corpus fund and initial infrastructure investment. 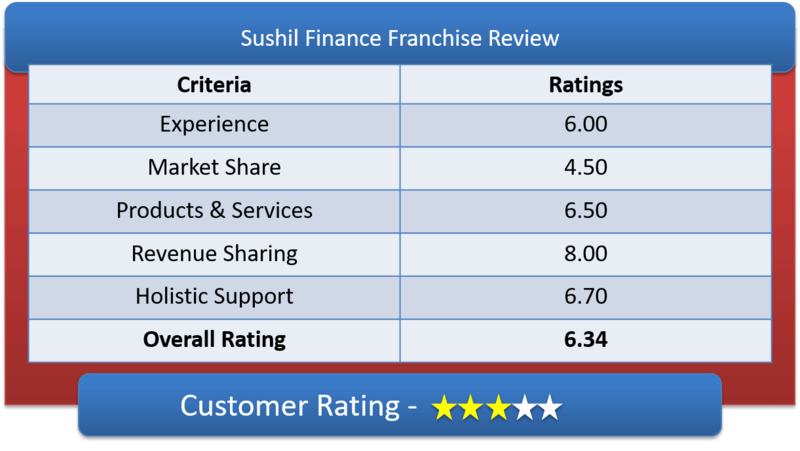 An Introduction Partner is one of the key partner for Sushil Finance franchise as it carries the lowest revenue sharing ratio. Hence, it ensures that an Introduction Partner receives all the requisite support. The support required in this case would mainly pertain to in depth knowledge about Sushil Finance’s product offerings and hence the team at this brokerage house arranges for a regular training programme. Currently, it is running an offer wherein, the sub brokership account can be opened in as less than as 9 days. It also has interesting revenue ratio offers. It also provides a “loan against shares” for its clients. Why partner with Sushil Finance?